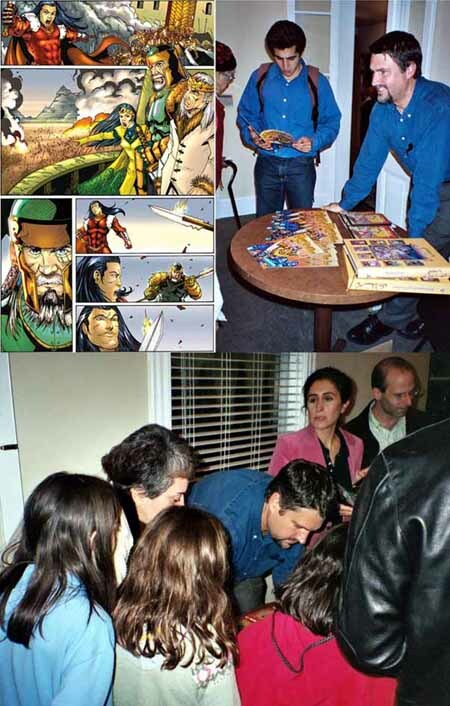 I had the opportunity to read a Comic Book in English based on the Persian legendary hero Rostam, and was delighted by what I discovered as a bold and successful attempt to render Ferdowsi’s legendary script into a visually stunning story accessible to every age group. Behrouz BAHMANI: It was about 6 years ago while working on a commercial project in San Francisco, for the Chinese chamber of commerce that wanted to do an anti smoking campaign for teens. we were tasked with producing a comic book story, and as a result we hired our good friend Karl Atstatetter a noted comic book artist, to help out. One of the samples that Karl sent looked almost exactly like I had always envisioned Zal (Rostam's father and the original hero in the Shahnameh). 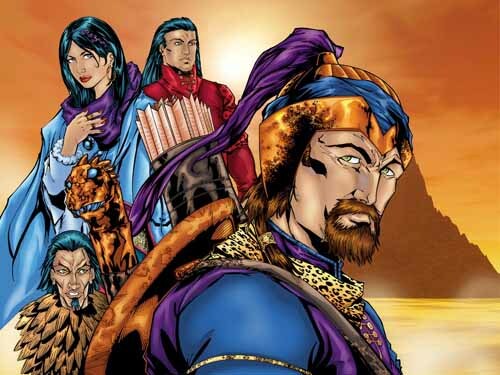 The whole idea of a comic book adaptation of the Shahnameh flooded my brain after that. DK: It must have been a challenge to boil down a 60,000 couplets Epic Poem to a comprehendible storyline? BB: Challenge? I would say impossible is more likely. First off I would just like to make sure your readers know that this comic is an adaptation and an interpretation. There are a lot of liberties I felt I had to take to make it a readable comic. The actual text is very difficult to condense down to the 32 page required format, and the vague references to previous sub plots too complicated to put down. Ferdowsi spins an incredibly complex web that I will argue no one person fully gets. BB: Absolutely, before we started I sent Karl, all the traditional miniature samples to look at. Then he called me after a few days and said that he understood the style and thought he could easily replicate it. I told him, NO! I want you to do something completely different! All of the armor, clothing, architecture, weapons and such are completely new and fresh and not related to the traditional at all. We felt we could take this liberty because the original Shahnameh was not illustrated. That came afterwards. So the very first illustrated copies were also interpretive creations by the illustrators of the time. At that time the miniaturist style was popular and it has somehow become associated with traditional Shahnameh illustration. I am frankly tired and bored with the traditional miniature genre, nothing against it; it's just not my taste. And I feel it certainly doesn't work with this kind of American style comic book. Also there are some traditional illustration points that are considered to be satanic, such as wearing the skull of the Deev as a helmet, and also the symbolism of a 2 horned beard. We removed those so as to not attract the wrong kind of attention and misunderstanding towards what is very pure and decent Persian folklore. BB: Hyperwerks is Karl's comic book publishing company and has a great reputation in the industry. We originally pitched it to him as "Hey, if you ever need a cool new concept to consider, give us a call." And that was it. Guess what? They eventually called! BB: As I read the original over and over again trying to decipher Ferdowsi's meaning, it became clear to me (or maybe I am now slightly insane!) that one inherent message of the Shahnameh might be that Ferdowsi intended that Rostam was in fact an embodiment of the Iranian people in the form of a hero. If you think about it, as a people, we are all defenders of Iran, and it's greatest heroes. We are often ruled unjustly and brutally, yet our love of Iran and our reluctance to stop defending her, never wavers. I like that metaphor a lot. BB: I would challenge anyone that the King Arthur version is more likely to have been taken from the Shahnameh! To me the message is clear. I think you need to be a bit insane (in a good way!) to come close to understanding a lot of the Shahnameh, because it helps! But what I get from it is that Ferdowsi is clearly warning us all to be aware of and consider our future. To think about it and plan for it. To not be so consumed with our present and ourselves and past greatness and glory. The use of Sohrab as the metaphor of the future and to have the tragedy that unfolds occur, is a dire warning to us all. That if we do not heed it, will result in us possibly not having a future. Pretty deep if you buy it. I'm not saying that is what it says, I'm just telling you what I think it means. I could of course be completely wrong. BB: I think the Shahnameh is exactly what it is advertised as in the very first verse. (... basi ranj bordam... etc.) which essentially says that in order to preserve your heritage you have to work hard at it, and that it is occasionally fraught with a great deal of sweet pain. That it is sweet makes it worth doing. I think he really wanted to preserve what was pre-Islamic Persian heritage, and had to contend with political issues in order to get away with it. And somehow found a creative and brilliant way to do it. The whole poem has this ongoing double meaning and a way to truthfully deny that what is being said is not subversive and in fact innocent. Very sneaky and brilliant indeed! BB: I do have the next 2 stories locked in at this time. I am trying to keep the metaphors going. The next book "Search for the King" illustrates the example of how the current generation can work with the younger generation to protect and preserve the concept of Iran. I think this is a very good message on the heels of the first book, especially in the current situation of Iran having a lot of young people who feel increasingly disconnected. Kind of another warning. The third book is about not heeding the warnings and what happens when things go really bad! That's all I'm going to say for now! We are taking it very slowly, one book at a time, but we want to go as long as possible. There are so many stories, plots, and good lessons in the Shahnameh that are perfect for this format. I even have one story outline, that is not in the Shahnameh at all, kind of like if Ferdowsi would have done one more what would that have been about. But everything is tied to the acceptance and support of the book by the reading public. So far we have had a great response.